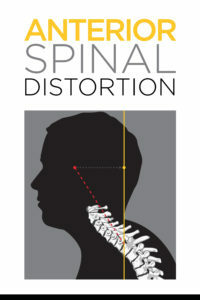 The majority of the general public has never heard of Anterior Spinal Distortion. Nor do they understand the implications/effects of it. In comparison, we all know what smoking cigarettes does to the body…increases our chances of lung cancer, among other things. At this point, it’s mainstream/common knowledge. So is the idea that bad posture isn’t ideal. Some people even understand it can lead to health issues. However, poll any group in Colorado, and ask them specifically what can happen if the head is seen moving in front of the shoulders. Very few know that answer. And this is something that needs to change. 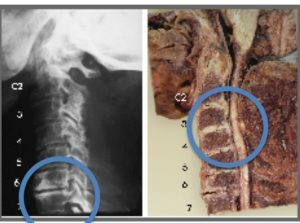 As we are now seeing Anterior Spinal Distortion (“Text Neck”) in kids as young as 11-12 years old. Does Anterior Spinal Distortion cause pain? Pain can be a result. But, not always, and especially not in young adults. The good news…discovering if anterior spinal distortion is playing a role in your health, or your kids’ health is relatively easy to assess. Take our At-Home Assessment to determine if this is a problem for you, or a family member. The research is becoming clearer all the time. Those with structural abnormalities will suffer short-term and more importantly, long-term effects. Like most health challenges, there can be a number of factors. One of the biggest is technology. The obvious reason for this… our increased dependency on technology. 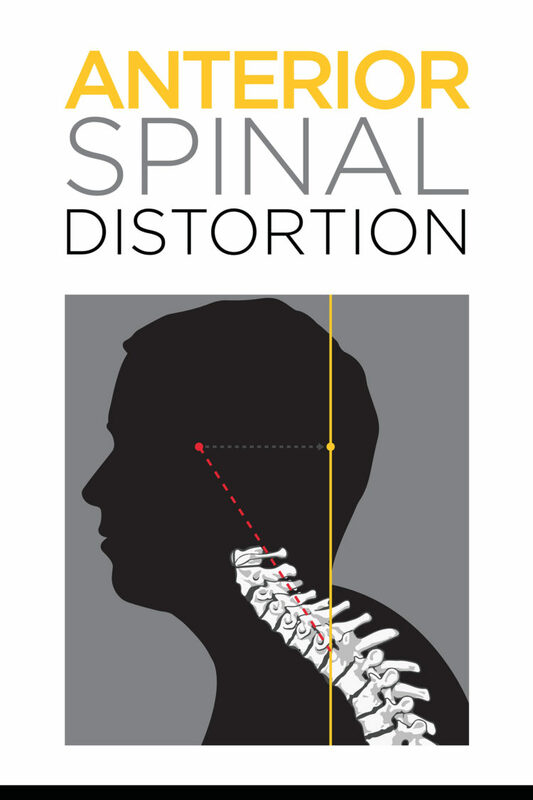 58% of adults are at risk for anterior spinal distortion. On average, adult smartphone users are spending 2-4 hours per day looking at their phone. That’s 700-1,400 hours per year! High school kids are spending up to 5,000 hours per year looking down at their technology! For optimal function of the spine and nervous system, the structure of the body needs to appear “stacked up”. This means the ear falls over the shoulder, and the shoulder is over the hip. From there, the hip should be directly above the knee. And finally, the knee should be over top of the ankle. Everything in one straight line. Any deviation from this symmetry will contribute to abnormal wear and tear in the body. Ultimately, leading to loss of function (keep reading to find out how the function in the body changes). 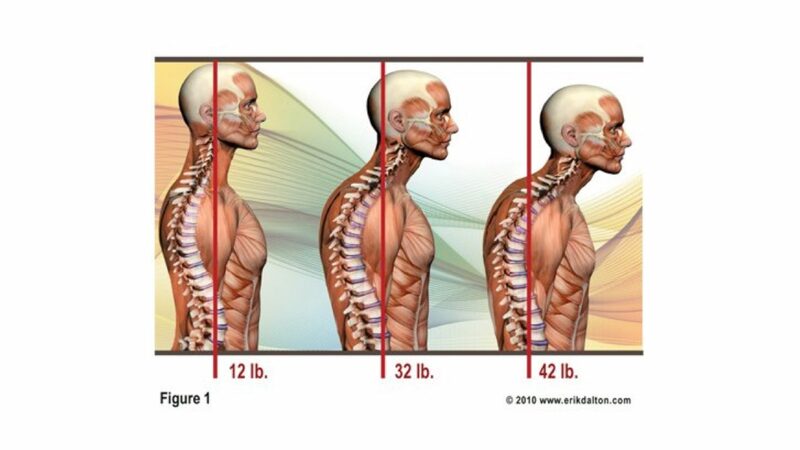 Arguably, the most important place to maintain upright posture is in the neck. Dissection of a spinal cord that has been impinged due to anterior spinal distortion. Neurology – The enormous amount of neurology housed in the neck controls many functions of the body, and requires solid structure/protection to work properly. Making this delicate electrical system easy to be interfered with when shifting of the spine is present. Stress Load – When the head is positioned over the body, it typically weighs between 10-12 pounds. But each inch the head moves in front of the body, it increases in weight approximately 10-pounds because of gravity. 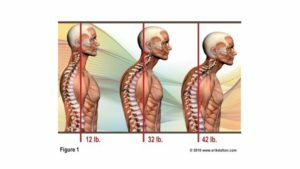 Therefore, any abnormal shifting of the neck will have dire repercussions down the spine and into other areas of the body, due to increased stress. What health issues can arise from Anterior Spinal Distortion? New research is coming out about the relation of forward head carriage and the effects it has on the body. What can you do for Anterior Spinal Distortion? -Stop looking down at technology. Instead, bring the screen up to eye-level. This eliminates stress on the neck. -Begin utilizing corrective exercises with your spine. Do you brush your teeth to prevent decay and cavities? You should also take time to maintain a healthy spine. -See a specialist who is trained in analyzing the spinal structure, and the neurology it protects. An expert in this area will be able to help make significant improvement to the overall function of your body.